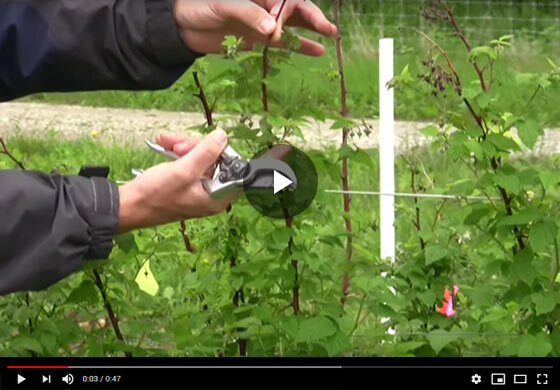 Join Gurney's horticulture expert as he shows off a prima cane raspberry plant and discusses its fruiting habits and growth cycle and offers tips on getting good fruit production. Hello everyone, Felix here at Gurney's and it's spring, we're working with raspberries. This is a prima cane fruiting raspberry and you can see here, last fall, that's where we had our fruit, you can see that, that is spent and died back and if you left your canes, you have early summer fruit. You can see the flower buds are developing here below where our fruit point was in the fall. So that's what you'll see on your prima cane raspberries and really in the spring, if you're wanting that fruit, you just want to take it back a little bit, I always like to go a little below just to get good tissue. These are generally a little bit weak, and then you get your crop load. After you harvest your fruit, you take this cane out and if you look down here at the bottom, you know, these are our new shoots coming up out of the ground that are going to bear this fall, so you want to encourage those shoots so we have a nice fall crop. That's all you really need to know with your prima cane raspberries for fruit production. Thanks for joining us.